To me a future classic, glad I took the effort to drive 200km's to get another bottle. This is just really, really good! 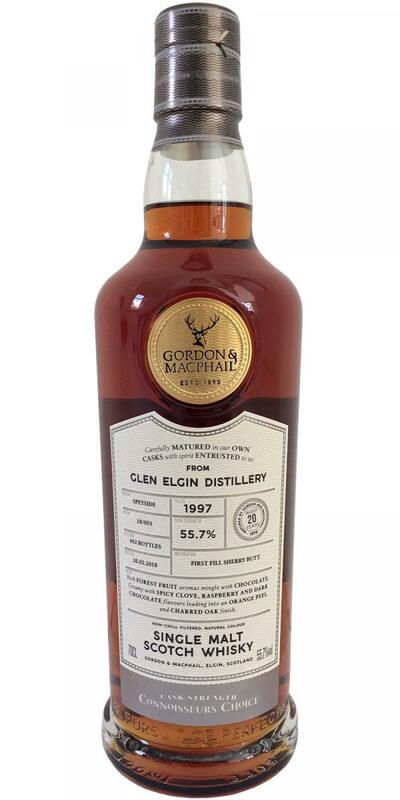 I have a soft spot for Glen Elgin but this is top 5 for me! Utterly stunning! Red and dark fruits: strawberries, raspberry, cherries, some figs. A touch of chocolate and a hint of leather. Cacao powder and a malty touch. All very juicy! Some espresso beans, toasted oak. Sweet red strawberries, raspberry, cherries and chocolate. Orange peel and juicy. Wow! Coffee some toasted oak but all so juicy. I am normally not a fan of heavy sherry influence but this is in balance! Juicy fruits. oranges, ripe cherries, some oak and menthol. A little bit of spices but then turning to a mouth watering finish. The first of the new Connoiseur's Choice Cask Strength series I've tried. Not a bad start for me. Very smart series for GM, with good looking bottles and labels. Solid nose. Some good quality sherry cask right here, man. Clean, and well-integrated. Dried coffee and dark chocolate. Yes, the sherry is VERY well-integrated. Bright and expressive, and definitely on the elegant side when it comes to heavy sherry. No point in listing all the flavors found in sherry. Just know that this is done well. If there is one complaint, this is on the drier side. Good length. A bit dry. On my second time tasting this, it is not dry at all... wonderful. 91 -> 92 points. What a lovely dram! Perfect ABV. 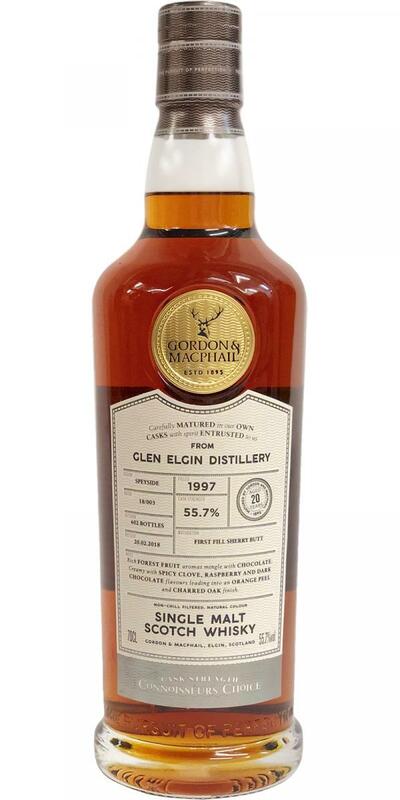 Maybe it should've been a tad more polished, but I simply like this Glen Elgin too much for it not to reach the 90 point barrier. Sweet orange liqueur with a whisper of paint thinner (in a good way), before moving on to raisins, cherry syrup and blackcurrants. A good amount of cocoa powder and oak, with hints coffee and burnt caramel. This is delicious! It's that same mix of dark fruits, European oak and and roasted coffee. Really, it perfectly complements the nose, as there is a touch of menthol here too. Nose: very jammy and perfectly clean. Juicy raspberries, cassis juice, cherry jam and fresh plums. Orange liqueur. Hints of oak polish. Gentle hints of espresso and toasted oak. Toffee apple and light vanilla. Rather perfect. Mouth: starts fruity but there’s a huge impression of vermouth after that, never had it like this before but it’s lovely. Think light winey notes mixed with orange peel, clove and cinnamon. Refreshing whiffs of menthol. Leathery touches and cocoa. Subtle roasted nuts and oak again. Finish: long, on light charred notes, Oloroso and chocolate. I feel sorry for not having bought more of it myself, it is downright delicious. Sherry, barrel and distillery character form a perfect symbiosis, which takes a long time to develop, and becomes more and more apparent with plenty of water. Blackberry and (black) redcurrant jelly, candied orange, powerful but not overpowering wood and sherry aromas that complement and enhance each other without the distillery being left behind. again berries, with dried dates, leather, charred wood and chocolate sauce. Wood and sherry aromas swirl in and over each other and only gradually subside. Slight smoke, elegant sherry, herbal and fruity notes. So complex and so pleasing. Wow. Wow! What a whisky, just shared a dram with two close friends and we were very happy. Lost of initial rum/raisins in the nose and then deep, warm and satisfying sherry bomb. Would love to get my hands on an additional bottle! Thanks Grinface for picking this one up for us. Here we go! I've got high expectations on this one, and it completely did the job... Starting fruity on the nose, with that typical little sourness, but than came in the sherry. A perfect combination where distillery character is still alive! Not a fan of G&M’s new pricing policy. This whisky is good / above average but not 160-ish good. Overrated in my opinion.